The new Wonderland stamp set in the holiday catalog is beautiful and exquisite and comes with antlers. The antlers jumped out at me immediately as a Christmas tree topper. So I put them on one of the trees from the Peaceful Pines stamp set, and I did love them as a tree topper. I let the partial card sit for a few days while I worked on other cards. Then I looked at it one day and knew what I had to do. A quick rundown of the card: The card base is Real Red. The Mint Macaron panel is embossed with the Softly Falling embossing folder. The wallpaper behind the Christmas tree is a card from the Project Life by Stampin’ Up! Hello December collection. 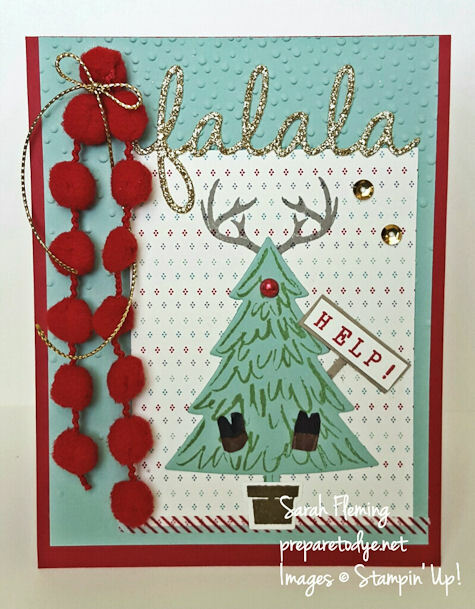 The “falala” is Gold Glimmer Paper cut with one of the Seasonal Frame thinlits dies, and the washi tape across the bottom of the card is from the Hello December Accessory Pack. If you love embellishments, and lots of them, do yourself a favor and get the Hello December Accessory Pack — so many fabulous accessories that are perfect for cards, traditional scrapbooks, 3D projects, and, of course, Project Life pages. Love, love, love. I stamped the antlers on the wallpaper and glued down the Christmas tree over the antlers. The antlers and the Christmas tree pot are both in Soft Suede ink. The Christmas tree is from Peaceful Pines, Wild Wasabi ink on Mint Macaron cardstock, and is cut out using the coordinating Perfect Pines framelits. Rudolph’s nose is a Pearl Basic Jewel, which I colored using one of the discontinued Cherry Cobbler Blendabilities. You can use a red Sharpie or any alcohol marker that you have. I made Rudolph’s sign with the Alphabet Rotary Stamp and Very Vanilla and Crumb Cake cardstock. I’m most proud of Rudolph’s hooves, because I had to google what reindeer hooves look like on the bottom of the hoof, then try to draw them and cut them out. They’re not perfect, but this is a fun card, so they’re perfect. The ribbons are the new Real Red Pom Pom Trim and the new Gold Cording Trim. Look how nicely the cording curls up. It’s really easy to work with, too. If you would like to buy any of the products you see, links to my Stampin’ Up! store are below.